Several Palestinians, Sunday, suffocated as Israeli army forces violently quelled a peaceful rally to protest the Israeli illegal expropriation of Beit Jala lands for the purpose of expanding construction of the apartheid wall. Christian and Muslim religious high ranking figures, locals, and activists participated in the rally, which took place at the seized land recently leveled by Israeli forces to resume the construction of the wall. Protesters raised Palestine’s flag atop of olive trees and chanted national slogans. According to WAFA correspondence, Israeli soldiers attacked the rally, firing tear gas canisters and stun grenades in the direction of the protestors, causing many to suffocate. They were all treated at the scene. 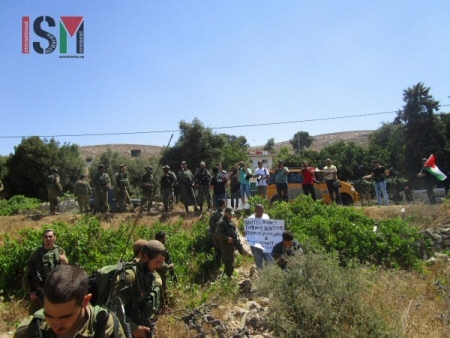 Protesters removed the metal gate erected by the Israeli soldiers at the entrance of Wadi Ahmad area to prevent locals from reaching their land. Meanwhile, Greek Orthodox Archbishop of Sebastia Atallah (Theodosios) Hanna, who also participated in the rally, said Muslims and Christians are present as one nation with no sectarian differences to defend Palestinians’ just cause. "We will remain steadfast on our land," he confirmed. He said the Israeli occupation uproots olive trees, because it doesn’t believe in peace. He said Palestinians will not give up on their loyalty to the Palestinian identity. Regarding the Israeli court’s decision to resume construction of the separation wall, Hanna stressed: "We don’t recognize Israeli courts, and we shall resume our struggle against Israel’s theft of Palestinian-owned land." “The wall has been opposed by local Christian leaders and the Vatican. In April it appeared that its construction had been blocked when Israel’s high court ordered the defense ministry to reconsider the route. But a subsequent ruling in July gave it the green light,” it said. “The role of the wall here is very simple: to cut off Beit Jala from Wadi Ahmad, an agricultural area of 3,500,000 square meters with thousands of olive trees,” Mazen Qumsiyeh, a veteran Palestinian activist, told +972. “By July 2012, construction of the barrier was 62% complete. It left some 3% of the West Bank territory cut off, west of the barrier. Completed as planned, the barrier will isolate an additional area of more than 6% of West Bank lands on the Israeli side,” added the center. “Construction of the barrier in the West Bank gravely violates the rights of Palestinians in the areas affected, restricting their access to their lands, crucial services and relatives on the other side of the barrier. The barrier also prevents any possibility of economic development,” stated B’Tselem. Dozens of Palestinians, headed by several Christians priests, conducted prayers on Palestinian lands that have been destroyed and uprooted by Israeli soldiers, in Beit Jala city, in the West Bank district of Bethlehem. Head of the Beit Jala City Council Nicola Khamis said the priests, the locals and various international human rights and Palestine solidarity activists gathered on the lands, carrying Palestinian flags, and signs condemning the ongoing and escalating Israeli violations and land theft. 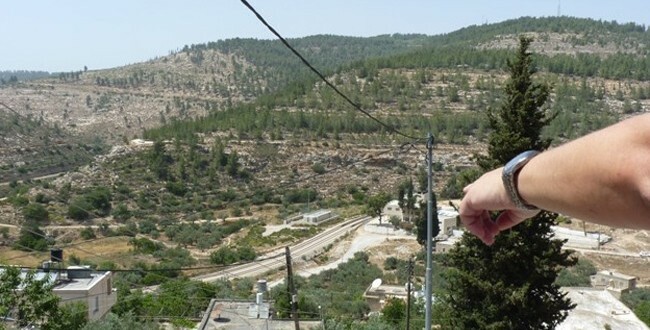 Khamis added that the local priests held special prayers on lands that were recently bulldozed and uprooted by the Israeli army in Be’er ‘Ona, especially in Ahmad Valley, and called for real peace and justice. The army bulldozed the Palestinian lands in order to continue the construction of the illegal Annexation Wall in the area. The priests called on Christian countries and leaders, Christians around the world, and the International Community to intervene and stop the ongoing Israeli crimes and violations against the Palestinians, their homes and lands, and their holy sites. Instead of spending Easter week praying, we fight with Israeli soldiers, says former Palestinian minister. A delegation of Palestinian Christians visiting South Africa has complained about Israeli discrimination that restricts them from accessing holy sites in Jerusalem during Christian holidays. “From 2005, Israel has been denying us access to the holy city of Jerusalem to practice traditions that are 2,000 years old,” former Palestinian minister Hind Khoury told a gathering in Johannesburg Thursday night. She said that Israel puts up check points every few meters during Easter week. “Instead of spending Easter week praying, we fight with Israeli soldiers,” she said. Khoury said that Israel has a policy of not allowing Palestinians to return to their cities once they have lived abroad for a long time. “I was the ambassador to France, and after four years they told me you do not live here even though my husband was there and I have a house and children there,” she said. Yusef Daher, executive secretary of the Jerusalem Inter-Church Centre, agrees with Khoury. “My brother and his three daughters and wife went to the U.S. on a work permit for three years. But now he cannot come back to live in Jerusalem where his daughters and wife were born,” he said. Daher said according to Israel law his family can only be allowed in as American citizens on a visitor’s visa not exceeding three months. He said although his brother and family are not allowed to return to their place of birth, Israel can bring in thousands of Jews from different parts of the world and gives them citizenship. Daher said although there are tens of thousands of Palestinian Christians inside Palestine, Israel grants them few permits allowing them access holy sites in Easter. “During Jewish holidays, Israel closes the whole of the West Bank and opens Jerusalem for Israeli Jews who come by walking, entering East Jerusalem without a single barrier,” he said. An American Christian pastor based at the Evangelical Lutheran Church in Jerusalem told the same gathering that the Israel-Palestine conflict is not about religion but land and resources. “It is a conflict over land. It is a political conflict over resources. It is a political conflict over principles of self-determination and decolonization,” said Reverend Robert O. Smith, who currently serves as co-moderator of the Palestine-Israel Ecumenical Forum of the World Council of Churches. Palestinian Christians clashed with Israeli border police near Bethlehem Wednesday after dozens of demonstrators, including priests, gathered to protest renewed work on Israel's controversial separation wall in the Christian majority town of Beit Jala. An AFP journalist said the protesters, who were joined by a few foreign activists, gathered in Beit Jala to protest building a stretch of the wall, which started Monday, after years of legal battles. The three Roman Catholic priests tried to pray among olive trees that bulldozers and mechanical diggers were seeking to uproot but were stopped by police. 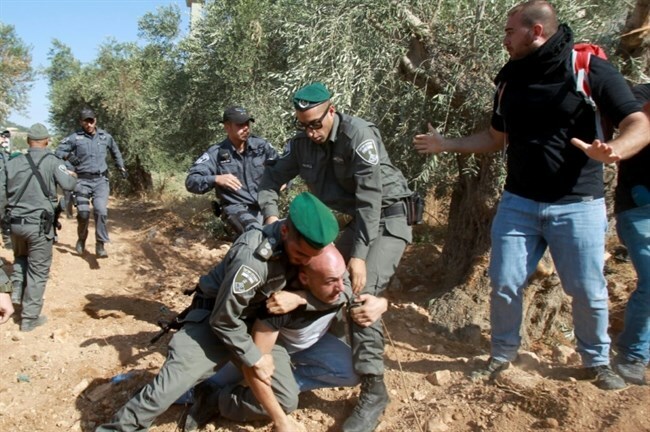 One demonstrator was arrested as he tried to plant an olive sapling in front of the excavators. 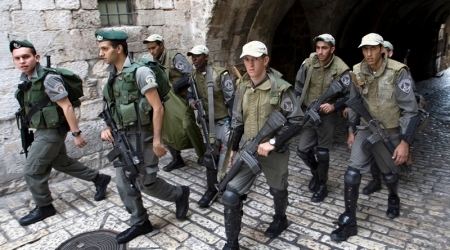 Police wrestled with protesters who chanted, "Israel is a terrorist state. It doesn't scare us." Palestinians, who refer to its as the "apartheid wall," say the barrier is a land grab, pointing out that when complete, 85 percent of it will have been built inside the West Bank. The wall has already completely cut off East Jerusalem from the rest of the West Bank. There has been fierce opposition from the local Palestinian Christian community, which has enlisted papal support, regarding the area of the wall that approaches Beit Jala and the adjacent Cremisan Valley. The case grabbed special attention when the wall was slated to separate Cremisan monastery from the neighboring convent and vineyards. It would have also separated Palestinians in the nearby Christian village of Beit Jala from their olive groves. Israel's High Court ruled in April that the work must stop and told the government to consider alternative routes. But, in a new decision on July 6, the court said work could go ahead, ruling that the previous ban referred only to an area of a few hundred meters(yards) alongside the monastery and the convent. The people of Beit Jala were surprised Monday when Israeli bulldozers started uprooting olive trees east of the convent and monastery. They are protesting against the confiscation of their land and the fragmentation of their lives and also fear that the path of the wall may herald expansion of the nearby Israeli settlements of Gilo and Har Gilo. Settlements in occupied territory are illegal in the eyes of the international community. The network of towering concrete walls, barbed-wire fences, trenches and closed military roads will extend 712 kilometers(442 miles) when finished, separating the West Bank from Israel. For two months, concerned Palestinians have demonstrated against the sale of the Presbyterian church in Beit el Baraka to right-wing activist Aryeh King. Beit el Baraka is a site on the road connecting al-Khalil/Hebron to al-Quds/Jerusalem and near Al Arroub refugee camp. Aryeh King is said to be "refurbishing" the church and the surrounding area in order to establish a new illegal settlement. Today was the 16th demonstration against the sale of the church and the threat of a new settlement. Twice a week they march on the road leading from Beit Ummar to Beit el Baraka and the church. The group of protesters consisted of men, women and children explicitly identifying as Palestinian Christians or Palestinian Muslims. They carried banners and Christian crosses and chanted slogans to defend the right of Palestinians to their own land. There was an excessive army presence and the many soldiers outnumbered the non-violent protesters by far. As the group marched towards the Presbyterian church their passage was blocked by the army. When they crossed the street in order to continue the demonstration and the march in the fields the army sped to further block the movement of the demonstrators. 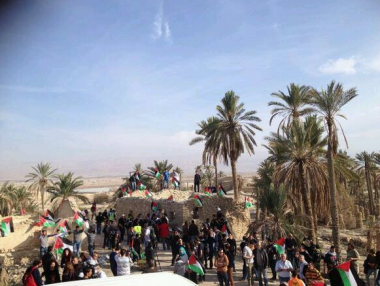 No weaponry was used and the peaceful protesters retreated to Beit Ummar and the surrounding villages. They will be back the coming weeks to continue to resist new illegal settlements that enable to annex Palestinian land beyond the internationally recognised borders (the ‘Green Lines’) of Occupied Palestine and ‘48. 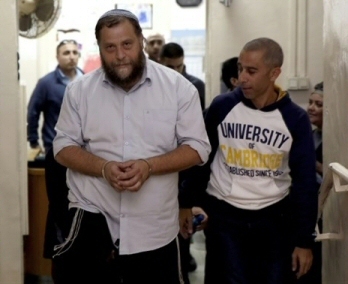 Israel police questioned and freed, on Tuesday, a Jewish extremist leader who condoned torching churches amid an uproar over recent attacks carried out by Israeli settlers, including the deadly firebombing of a Palestinian home. Benzi Gopstein, who heads far-right group Lehava, has not been linked to any recent attacks, but his comments regarding churches came at a time of heightened sensitivity over Jewish extremism and drew outrage from Roman Catholic officials. Israeli police spokesperson Luba Samri said Gopstein had been called in for questioning "about his comments regarding the burning of churches." He was later allowed to go free, she added. During a debate with religious students last week, Gopstein defended the idea of burning churches, reportedly invoking a medieval Jewish commandment to destroy places of idol-worship, according to a widely broadcast recording of the event. A formal complaint to Israeli Attorney General Yehuda Weinstein was later filed by the body in charge of Catholic properties in the Holy Land. In a letter seen by AFP Monday, the Custodian of the Holy Land called for Gopstein to be prosecuted and for Lehava to be outlawed. 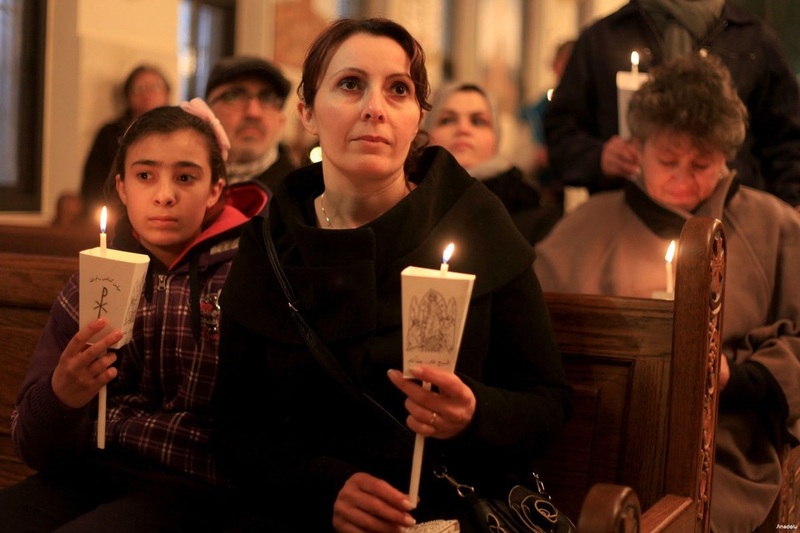 "To our utter dismay, recent years have witnessed an alarming and frightening increase in violent attacks against Christians, Christianity and Christian institutions in Israel," the letter said, denouncing an "atmosphere of de facto impunity," the letter read. Gopstein's lawyer Itamar Ben Gvir, speaking on public radio, said "our client has been summoned to interrogation in the wake of pressure from the Vatican." "I ask myself what the next step will be. Will the pope decide to file charges?" Gopstein, who lives in the flashpoint occupied West Bank city of Hebron, has previously faced police questioning. He was one of 10 Lehava members detained last year over an arson attack on a mixed Jewish and Palestinian school in Jerusalem. Lehava claims to fight for Jewish identity, in particular by opposing marriages between Jews and non-Jews. Gopstein's summons Tuesday followed attacks, attributed to Jewish extremists, on Palestinians and Christian holy sites in Israel and the occupied Palestinian territories. A Palestinian 18-month-old Ali Dawabsha was burned alive and his father was fatally injured when alleged Jewish extremists firebombed their home at the end of last month. Hours earlier, an ultra-Orthodox Jew stabbed six people at a Gay Pride march in Jerusalem, mortally wounding a 16-year-old girl. On June 18, an arson attack occurred at a shrine on the shores of the Sea of Galilee in northern Israel where Jesus is believed to have performed the miracle of loaves and fishes. While Israeli prosecutors have charged three Israeli extremists in the Sea of Galilea arson attack, officials reported Monday that all suspects detained in a probe into the deadly attack on the Dawabsha home had been released. The suspects had been detained during raids in Jewish outposts nearby the family's village. While Israeli Prime Minister Benjamin Netanyahu labelled the arson attack as "terrorism" and pledged to use all legal means to track down the perpetrators, critics argue the legal system is not capable of properly prosecuting Israeli settlers. Palestinian leadership and rights groups say that Israeli government policies -- including support for settlement expansion and frequent impunity for settlers -- allow such attacks to take place. Bentzi Gopstein, chairman of radical anti-assimilation group Lehava, drew law enforcement's attention after recent recording in which he said church arson was legitimate under Jewish law. 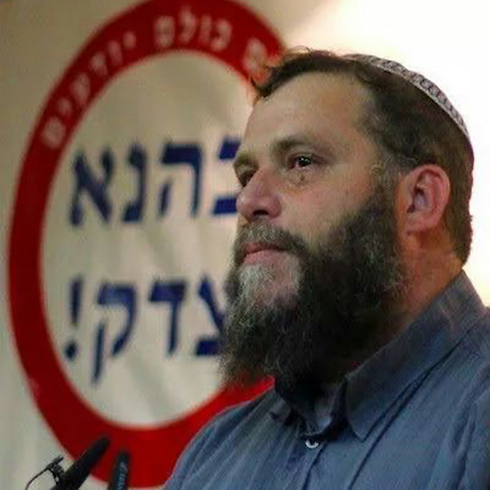 Police have been investigating the chairman of the far-right Lehava group, Bentzi Gopstein, for possible incitement, Judea and Samaria District Police said Tuesday. According to the police department's spokesman, Gopstein was summoned for questioning at the division for nationalistic crimes, where he was asked about his statements about church arsons. Gopstein's lawyer said the police had submitted to the will of the Vatican, which on Monday called on Attorney General Yehuda Weinstein to indict Gopstein. Just last week, Gopstein was recorded at a haredi panel saying that burning churches was legitimate under Jewish law. "Do you support burning churches in Israel, yes or no?" by Benny Rabinowitz, a writer for the ultra-Orthodox daily newspaper Yated Ne'eman, Gopstein replied that Maimonedes had ruled that churches should be burned. "Are you for Maimonides or against him?" he asked, rhetorically. The debate occurred about a month after an arson attack caused extensive damage to the interior and exterior of the Church of Loaves and Fish on the shores of the Sea of Galilee in June. Hebrew graffiti was found at the scene that denounced the worship of idols. Gopstein's statements at the debate shocked many attendees. Rabbi Moshe Klein told Gopstein, "You are on camera and being recorded. If this lands in the hands of the police, you will be arrested." Gopstein answered, "That’s the last thing that worries me. I'm willing to sit in prison for 50 years the truth." Immediately after the meeting, Rabinowitz exposed Gopstein's remarks on Twitter, igniting a social media frenzy. Gopstein denied the report, saying he was merely quoting Maimonides as a part of a theoretical debate over Jewish law. The Custody of the Holy Land asks AG to indict radical right-winger for saying church burning complies with Jewish law. The Custody of the Holy Land, the Vatican's representative body in Israel, called on Attorney General Yehuda Weinstein to indict high-profile Jewish supremacist Bentzi Gopstein on charges of incitement to racism. In a letter to Weinstein, the Custody's legal adviser cited comments Gopstein made at a panel discussion last week, where he said that burning churches complies with Jewish law. "I implore you to employ all the legal measures at your disposal," Adv. Farid Jubran wrote on behalf of the Vatican. "Mr Gopstein's incitement puts churches and Christian communities in a clear and present danger." During a panel discussion at Jerusalem's Netivot Hochma on Wednesday, Gopstein said that "burning idolatry" is a legitimate Jewish practice that was stipulated by Maimonides, the Medieval Jewish sage. Gopstein is the chairman of Lehava, an organization that seeks to prevent the "assimilation" of Jewish Israelis.